This diorama has so much going for it, it's amazing. 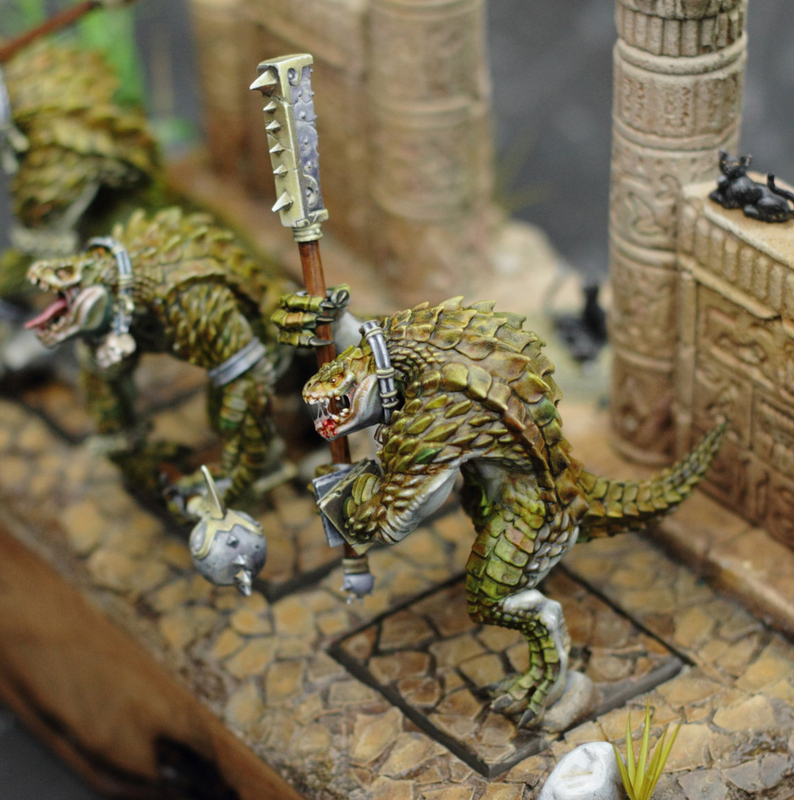 I like the combination of Lizardmen with Tomb Kings. 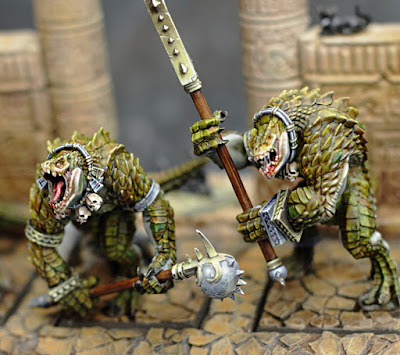 Normally it would seem out of place, but since those custom Kroxigor have a very strong crocodile vibe to them it works due to the Egyptian god Sobek. Those custom Kroxigor by the way are miles ahead of the official ones. The painter claims they were sculpted digitally by a friend and then 3D printed. Those have to be the most detailed and smoothest 3D prints I have ever seen. I really hope whoever made these decides to go into production with them, because they are stellar. The paint job on these guys really does them justice as well. It has a perfect Crocodile feel with the colors and just the right amount of contrast between the green and white. The diorama they are in is great as well. They really nailed the Egyptian look of everything and I wonder how much of the was custom made. I think this hobbyist was going for more of a true Egyptian look as opposed to Tomb Kings, so the lack of skulls is okay. Another nice addition to the scenery are the cats scattered around. You can see one lounging on the wall in the picture above. This is again, another great tie in to Egypt and adds little points of interest around the ruins. 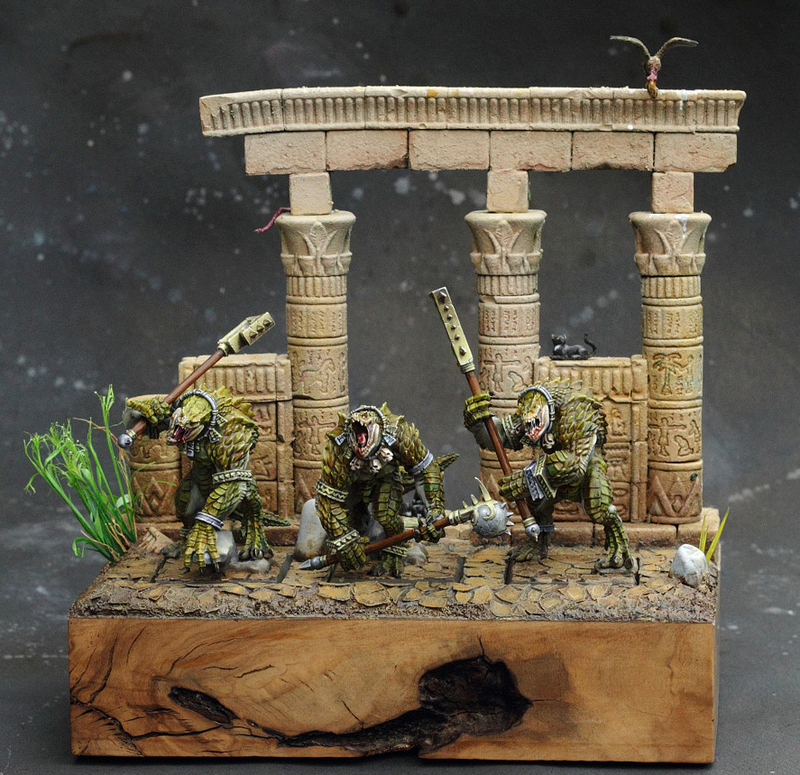 The only thing I wish this hobbyist had done was tie the Kroxigors' weapons and gear into the Egypt motif more. 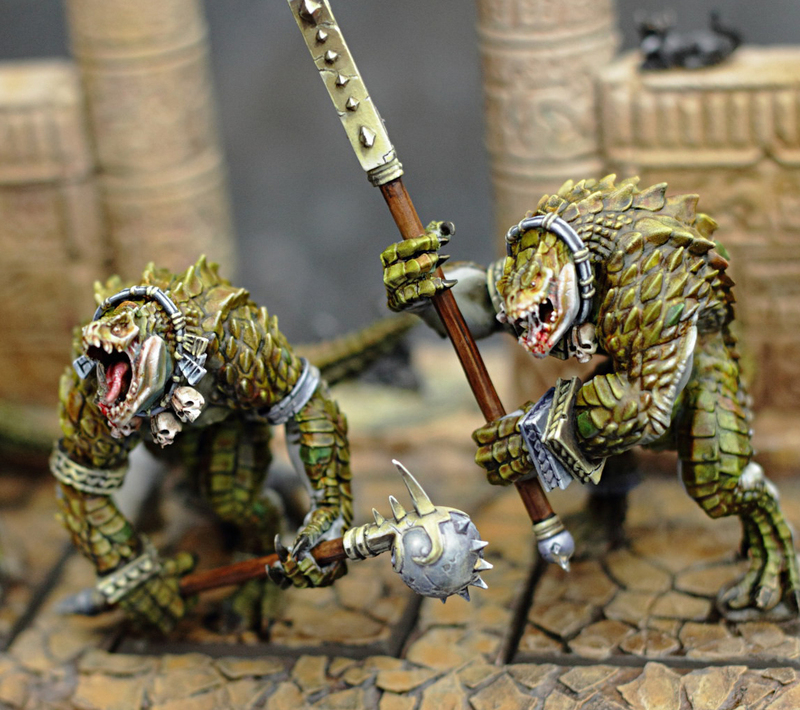 Right now they still look very much like Lizardmen/Aztec stuff. I get not wanting to change the models up since they were custom printed and you want to show them off, but it would have been a nice touch. This is just nitpicking though, and overall this whole piece is really fantastic. I highly recommend you click on the link below to see even more angles and shots of it. Age of Sigmar Painting Competition!